Hello! My name is Amanda and I am awaiting the arrival of my first husky puppy, Sirius! A little about me: I just bought my first house a few months ago, I have three cats, and work from home. I have always wanted a husky since I was a child, but always felt ill prepared for one until now. My boyfriend, approaching Christmas, has asked me a couple of times how I would feel if someone gave me a pet as a present. Being an animal lover and raised with animals my entire life I would never turn away an animal. If I couldn't keep it myself then I would take care of it until I found someone who could. As for actually keeping the animal as a pet I told him I couldn't have another cat and if I got a dog it would be a husky and have to be a puppy (my cats are my life and I know huskies have high prey drives. Yes, there are some used to being around cats, but I don't think I would ever fully trust it with them.). 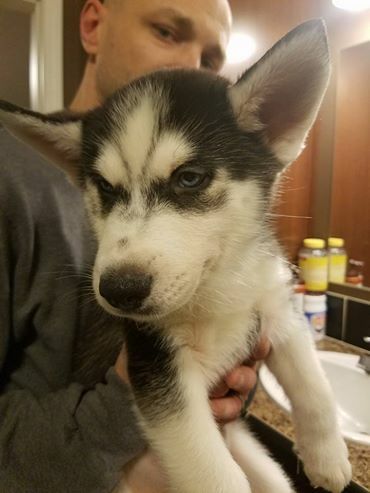 I found out a week ago that he had found and put a deposit down on a husky puppy that would be able to be picked up on January 4th! The puppy was the only black and white one in the litter and a male. I believe he is going to have brown eyes from the photo. I have been so over the top excited for my new arrival that I have ordered all of his necessary items (short of food because I want to wait closer to the day to get that), done more research than my brain could hold, and created a blog to keep myself entertained until he gets here. Why on earth I told him to tell me about the puppy this early is beyond me! Anyway, that is me and my situation right now! I really liked the look of this forum and am hoping to fit in well here despite not being a previous or current husky owner. Welcome to the forum Amanda! Sirius is a cutie....little quiet on the weekends, although more may be on tomorrow since the US is hunkered down with the extreme cold weather, currently 17 here in west central Texas. Anyway, great group of people here, if you have any questions don't hesitate to ask, and can't wait to see more pics of your pup! Hi Amanda and I second Renee's welcome to the forum. As she said, it's always a bit slow over the weekends since people are out with their snow dogs - but with the weather most of the US is having, I think I'll stay huddled down around my space heater! Cats - while Husky's do have a high prey drive, many will recognize that this is *our* cat and that one is a stranger - and fair game. I have three adult Huskies and over the summer added two kittens who now wander the house and drink from the same water bowl that the dogs use - often at the same time. Yes, they do get chased if they jump and run, but it's obvious that the dogs don't intend any harm, they don't catch even if they could. I looked over once and Sasha, my most cat friendly dog, had my black cats head in her mouth and the kitten wasn't even bothered ... weird! Starting off with cats and puppies, you'll have an easy time if even one of the cats is willing to defend their turf, puppies who grow up with cats and who've gotten a face full of claws learn to leave them alone and it normally lasts into adulthood. Thank you both! No worries, this is one of the only weekends I have to relax so I decided to take advantage of it. Haha I have more of an active life than I thought! I will certainly share photos of him when I get him. I can't wait to create my own topic in the Scrapbook section! Welcome! I'm new here too, just joined about a week ago. Like you i have always wanted a husky, and we got our boy December 10th (He was born October 10th). He's growing so fast! We have 2 other small dogs and 1 cat. So far he hasn't shown any interest in the cat but he plays constantly with our other puppy. Yes, we have 2 new puppies in our house! 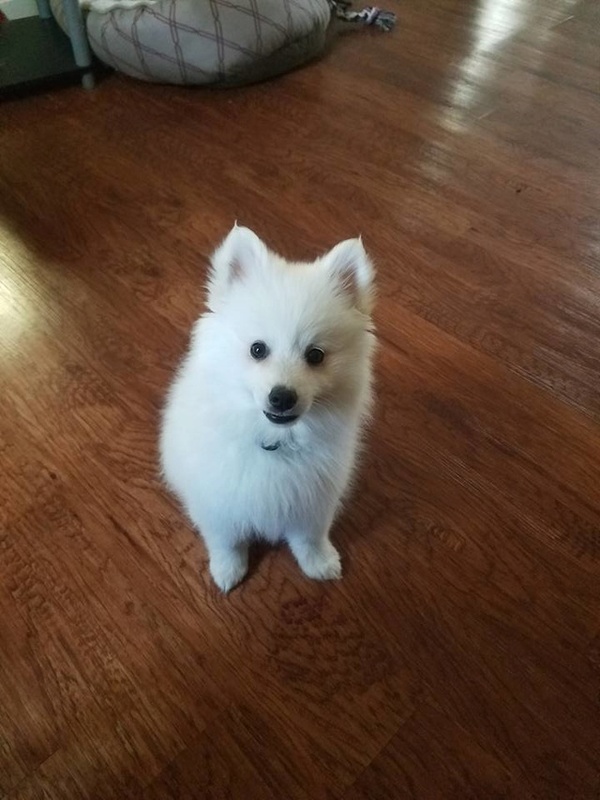 The other pup is an american eskimo and she's 3 months old. When we decided to get the husky, we put down a deposit on an unborn puppy. So we had to wait almost 10 weeks before we got him! At least you only have to wait a month! Oh my gosh, they are so cute! I'm already going nuts, I couldn't imagine waiting that long! lol Your pups are so cute!! American Eskimos are so freaking adorable. Welcome to the forum. A lot of cuteness on this thread. Thank you! You have a very beautiful pup. Welcome to the forum! You are going to LOVE having a husky they're addictive! You can't stop at just one can't wait to see all your pics and hear your stories once he is home. Oh, I know! It's driving me nuts not having him yet! I keep hearing that once you get one you'll want more. I've already forwarned my boyfriend. haha Thank you for the welcome! hi, welcome to the forums. so adorable. we had a small dog that my husky grow up with it took sometime to for them to get use to each. Leo also live with 2 canaries and on rabbit. he dose well with all out non canines. That's awesome! I wish I could have birds and rabbits, but I have at least one cat that would go on a murder spree if I did. :/ Your boy is so handsome! Subject: Re: Greetings From Southern Indiana!